When a person you've never met randomly contacts you via email and offers to give you a motorcycle, I think a perfectly reasonable response is something along the lines of: "You, sir, are full of the horsey poo-poo." Then, when they do actually give you that motorcycle, well, that... can be a little disconcerting. It's the sort of experience that upsets the balance a little. Having recently had just this experience I find myself feeling happy, but also oh-so-slightly confused by an action that goes against my understanding of How The World Works. 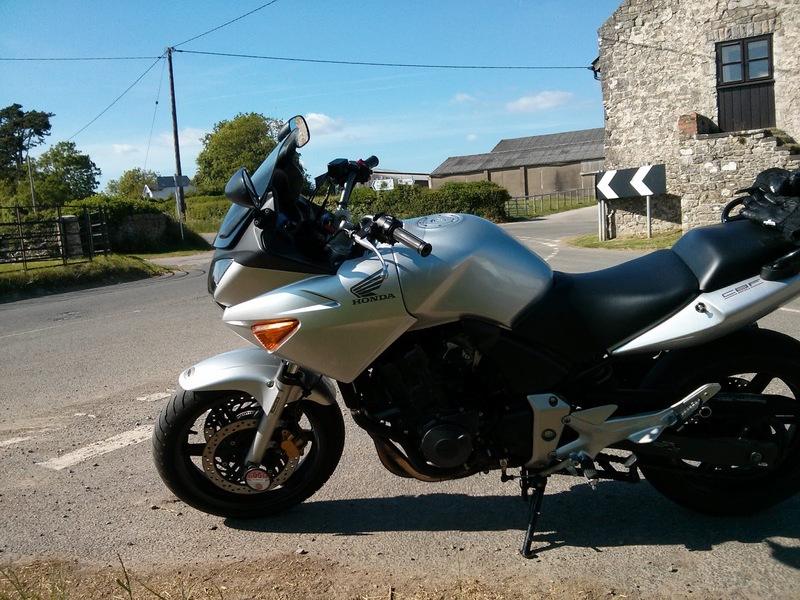 I should back up a bit, though, to return to that pivotal life event I've just glossed over: I have a motorcycle, yo. Remember several months ago, when, after reading a Hunter S. Thompson book, I decided that 18 years after getting my motorcycle license I finally wanted to get a motorcycle? Yeah, well, that finally happened. All the details of the long and ridiculous journey to get to this point have been documented on my motorcycle blog, but here's what's relevant: as a result of that blog a fella got in touch with me and said that if I did some copy writing work for him he'd get me a bike. The alarm bells just go off when you read that, don't they? And when I tell you that the dude turned out to be really cool and true to his word, you're still thinking: "No, that can't be right. Chris is leaving something out here." Nope. Really. That's what happened. It sounds like the sort of badly formed lie my 6-year-old self would compose ("I didn't break your vase, Mom. It was a ninja..."), but it is, in fact, the truth. And it is a truth that kicks at the walls of my reality somewhat because it challenges my understanding of how people work, and how the world works. Back when I used to teach Welsh, one of the arguments I would offer in favour of learning a new language is that it gives you a chance to see your world in a different way. Discovering and ingraining in yourself the truth that there are an endless number of names for objects as well as ways to describe them helps you to see that your world, your life is not beholden to the structures created by other people. I used to think this an optimistic message to bring to the economically deprived area in which I taught: the old way of thinking that has you spinning your wheels does not have to be your way. But, kinda, sorta, it does, doesn't it? The experience of earning a bike in exchange for my skills is a challenge to the standard capitalist structure that rules almost all of our lives. We have grown so comfortable with having money as a middle man between our labour and the goods/services we obtain that we struggle to imagine life functioning without it. That's the idea at the heart of so many post-apocalyptic films: that without the invisible hand, and especially its structural trappings, everything falls apart. Certainly, there is a strong argument in favour of such a currency-based system. Without it, one would find it very difficult to move ahead in life. I know now that my writing ability can get me a motorcycle. Presumably it would also be enough to get me fed, maybe clothed and sheltered. But would I ever have a house or land of my own? Wouldn't I always be subject to the indefinite kindness of someone who has more than me –– a king or baron or what have you? Bartering has its weaknesses. So, I'm happy to keep the money system. But I find it interesting and exciting to realise that there are alternative ways of getting things. Just because I'd usually exchange money for something doesn't mean I can't exchange my abilities. And that gets my mind spinning: What can I accomplish? What could I trade my skills for? It's just too bad I don't possess more useful skills. I have had daydreams in the past about similar things happening. "Sure, I'll do [insert skill here] in exchange for a pretty new Ducati/boat/exceptional guitar/etc." But you went and did it. You are living the dream, man. I think a lot more bartering goes on than people realize, particularly between entrepreneurial types. So the question we'll all be dying to know the answer to (on either blog) is: where are you going first? Aaaahhh Chris! I am so excited that it worked! Talk about someone making things happen! And Quickly!! You are the perfect proof of a few basics I understand about the Universe. See It, Believe It, Love It, Receive It. The Believe It part confuses most people. You have to believe it can happen, that it's already yours. You had See It down. You wrote about it often, seeing yourself on the ride. You had the Love It part down. All that was missing was to Believe It was coming. Then it did. The other thing I love about the basic principals of the Universe is that it has no schedule. If the time is right, things happen. If they are not, it doesn't. But if we are really looking deep inside, being true to ourselves, the "right next step" is usually pretty obvious. Your next step was ride. What's next? Look deep inside and point in that direction. Then tell us all about it. :) That's the See It part. So you now have two bikes huh?